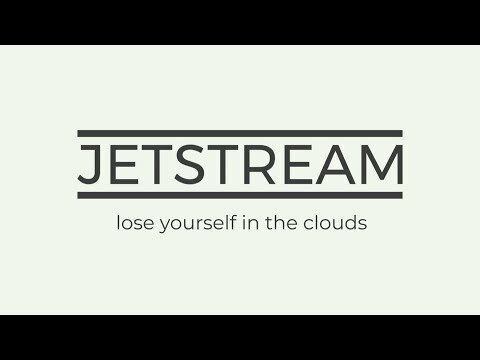 Jetstream is an elegant puzzle game where you soar amongst the clouds. Play through dozens of sculpted levels as you travel around the globe. Grow your line to reach the goal. There are 24 puzzles and a few different mechanics get introduced along the way. I made it for Ludum Dare 34 this past weekend. I had the core mechanic down in the first few hours after starting to code, and then I spent the rest of the time iterating and polishing. I'm quite happy with how it turned out, but I'm still itching to add a myriad of little improvements. If I get some time, some things I'd want to add include: more levels, more mechanics, and a procedural infinite mode. I'd be keen to hear what everyone thinks. Did you figure out how to play easily enough? How was the difficulty curve? General impressions? I liked this - it was easy to understand and the functions of the different coloured tiles was apparent without being confusing. There were one or two levels that got me scratching my head, but I got there in the end! You could also perhaps add variation by having shaped levels (? ), I mean not just x by x tile grids, but overlapping grids (like some sudoko games), or other shapes - I appreciate that a grid style works best though. Dunno about the difficulty curve, it certainly ramped up as more stuff get introduced. Like I said at the event, this is a great little game, even in it's current form. @Franciosvn I don't think just shipping it is a good idea. You know my approach to releasing games, in that I think releasing them halfbaked cripples their chance of ever getting traction. I recognize that it's possible to waste a lot of time working on a game that is unlikely to recoup that time, as I'm sure you're aware my stance is do it properly or move on quickly (and to keep on testing which move you should take). I think as a Ludum Dare concept this game is quite brilliant. I have zero criticism for it as a Ludum Dare entry, it's rock solid. Assuming you're aiming at IOS, the art style doesn't say "RETINAL DISPLAY". It's nice an minimal, but it's very low fidelity, and looks a little childish next to games like Prune. (Not childish in the sense of made by a child, but aimed at children because of the big blocky colours). This really comes down to what you think the audience is, this looks like a minimal game, but sort of appears aimed at children, these two thing conflict in terms of audience appeal. I do like the jiggling blocks, and the wiggling avatar block, though I do feel like these movements are drawing from the vocabulary of action games more than minimalist puzzle games. I am really not sure what this audience wants. Even Threes, which seems to me to be on the "fun" side of successful puzzle games aesthetically , is a lot more understated in its juice. So I feel like you might be signalling appeal to the wrong audience with the flavour of the juice you're applying... I might be 100% wrong about this as I don't play these games and I'm only looking at the successes (the failures are pretty much invisible to me, so I don't know what they are doing). I think this game could get very complex with extra mechanics. We spoke about this as well, but it might be nice to every now and then restart the complexity of the game with levels similar to the early levels, with just a few mechanics and a small problem space to explore. Kind of like how World of Goo has "worlds" and the start of each world introduces a new theme or mechanic. That way the game has spikes of difficulty, with easy levels that teach new concepts in between. Some of the later levels do feel a little trial and error (like Tuism pointed out). I don't know if there is a way round that (like ghosting your previous choices?). I think having a little trial and error might be the nature of the game, and being able to luck into a solution works for some games, so long as there are solutions where the player feels responsible for figuring it out. The sounds and jiggles are nice (and once again make this feel like a great Ludum Dare entry). However I think they could be better still for a commercial game. A better sense of progression. I'm not certain what to do here, but a series of numbered levels isn't the most compelling system. Like I said earlier, I'm much too far away from the mobile market to make any predictions of success. The games I know of that have done well appear to be much more polished than the Ludum Dare state of Streamlined. I don't know whether that is a prerequisite for their success, but it seems to old true to me. None of this critique is intended to minimize the achievement of Streamlined as a Ludum Dare entry. It's a little gem of an entry (though I'm not sure if it's to the taste of the Ludum Dare community judging, I haven't seen many minimal puzzle games be rated highly in the past... In any case I don't think winning Ludum Dare is as important as making a rad game). Thanks everyone for all the positive comments and feedback. Fortunately for me and how I currently design games, I think I can get away with working a lot more on the mechanics and then revisiting the visuals later. I do take your point on it kinda straddling the line between casual and intelligent (with a bit of "actiony" juice). I think this is something that's gonna have to be informed by what direction the mechanics go. Although I'm not sure if it would make sense to try go for one over the other for market reasons. I do feel like I'm also a little out of touch with what sort of visual design would be best. What are people's thoughts on this? In terms of what direction to go with mechanics, I feel like at the moment the choices offered to the player feel a bit too random and there's isn't enough deep tactical decision making. It currently feels kinda nice when you solve a level and pretty bad when you get stuck, but I think giving the player more "meaningful" decisions would perhaps push that a bit more towards the positive side. As such, while I have a list of more special blocks, like portals, reflectors and other variations, I'm inclined to try something I haven't heard suggested yet: multiple lines. I'm not sure if I got this idea from Snakebird, but the basic idea is: you have more than just the one line (probably just 2 for now), and you can switch between them and move them separately. I'm not sure if the switching should be manual or automatically cycle, but this seems like something that'll give the player more meaningful tactical decisions, especially if they can manually switch. What are people's thoughts on this? I like the idea of the multiple lines. I have almost no idea what it'd actually play like, but I like the idea of playing two lines simultaneously. They start at different places on the map, and each have to reach their own goals, but when you press in certain directions you might cause the one line to block off the other line's path. I don't know if in practice that'd actually be any good. Out of the existing blocks, the portal is my least favourite at the moment, mainly because it feels like a board wipe, where the things you've done up until that point seem to cease mattering. I think it'd be more enjoyable if the portals appeared in pairs on the same board, and entering one portal meant leaving another, but everything from before entering the portal stays on the board. Gave this a play and think it's awesome. Would love to see you take this further. Also just want +1 on what @MCA said about the difficulty curve. I had a very similar experience. Both lines would be controlled simultaneously by any directional swipe. Special grid elements could include things which tag / switch elements in the OTHER grid. Stuff. Ideas there. Above could be less interesting than multiple lines on one grid though. Snakebird combinations *did* provide lots of interesting interactions. Yip, I plan to do it mostly for myself (so I can test properly), but I'll probably expose it at the same time. Technically I think it should be pretty easy to try all of these combinations. Although, my gut feeling tells me that having 2 lines on the same grid (where you can manually switch between them), will open up the problem space the most - it is effectively doubling the average number of choices the player has. Well actually, from what I'm seeing of doing two lines in two grids is that it actually makes it easier, because you control both with one movement, and that eliminates a lot of impossible moves. Not necessarily. If you assume you just have to be able to move one of them, then you can quickly get into situations where one line moves and the other doesn't (or they both move, but not as far), so you end up with them "out of sync." I think it'll make it a bit harder, but it might make level design a lot more difficult. I've released a new post-jam version with an infinite mode (procedurally-generated levels). You can access it quickly by exiting to the menu (top left button in-game) and selecting the last level with an infinity sign. I'm pretty happy with infinite mode levels for now, but they could be a lot better. Some of them are quite good, but you frequently also get a dud. I plan to use this as a way to quickly test other mechanics, but I already quite enjoy playing through a few levels myself. I'd be interested to hear what other think of this? Do they have a good level of difficulty? Are they interesting enough? If you wanna skip the old levels, just leave to the level select screen and go directly to 25. I'm curious to hear people's opinion on the new mechanic before I taint it with my own impression. Did you find it easy to understand? Do you prefer the multi-line puzzles to the single-line puzzles? General impressions? New special tiles, like: portals, doors/keys, reflectors, etc. Explore multi-line mechanic a bit more: simultaneous lines and lines that disappear when reaching the end. Mockups for new aesthetic directions. I feel like I'm losing a bit of steam with this project, so I'll also be spending more time trying to figure out what my "long-term" plan is. I figure that by the time I finish the first 2 of those 3 things above, I'll need a much better idea of where I'm aiming. The styling of the graphics is really great. Cool - played it a bit. What exactly is the challenge mechanic? There doesn't seem to be a 'complete' in minimum moves goal. @bischonator: Thanks for trying it. There isn't currently any sort of challenge mechanic, sorry if I gave that impression somehow. For a challenge mechanic, currently minimum moves seems like the only thing that might work generally, but I'm quite sceptical it'll actually work. My anecdotal tests tell me there isn't much variance in the solution length, and if you take undo moves into account then it just becomes an exercise in playing the level again optimally after you've solved it. As such, my current thinking is to not include any sort of challenge mechanic. Oh No hides a time challenge mechanic for you to discover if you want it. I quite enjoy that. @dislekcia: Is it the discovering part you enjoy or the time tracking itself? If the discovered challenge mechanic was "get a puzzle solving streak without making any mistakes," would that be better? @francoisvn: I enjoy the time challenge in that particular game, it feels good to better how quickly you solved the random puzzle. Then again, that's pretty much the only possible metric they could have tracked in that particular logic puzzle - number of moves would always be equal, for instance. I find the score element of Oh No completely superfluous, but it doesn't bother me because there's no progress that hinges on it. Just having a thing that gets tracked and reported back to you after you play a cerebral style of game can be very rewarding, but you have to be wary of what you're encouraging players to think about maximising. I have no idea what the potential stats you might want to record for Streamline. It's probably a good bet to record a bunch (bonus points if they're on completely conflicting axes, so you can't score well in one without completely blowing another) and then see what players gravitate to. That could help you determine different playstyles too. Cool idea with using the stats to determine different play styles, thanks! I'll definitely look at adding a bunch and then trimming down the list, but I think I wanna focus on trying to get the mechanics a bit more refined beforehand (so I don't slow that down by maintaining a stats system). I'm also thinking of focussing more on the hand-crafted levels (vs the procedurally-generated levels) cause I think I can create a much better experience. I guess this conflicts a bit with general stats, but it could be possible to create alternative goals for each level that are a lot more interesting. I'm still a bit uncertain about the multi-line mechanic. Has anyone tried it? What did you think? Did you find it easy to understand? Do you prefer the multi-line puzzles to the single-line puzzles? General impressions? I gave the multi-line a go - I liked it :-) I think making crafted levels is a good way to go - more work, but the levels are better and there's a sense of progression as things get harder. Liking the look of the teleportation tiles! @francoisvn Love what you've done with the new icons on the blocks, it makes it a lot easier to understand what each one does. Like the new "change direction" mechanic, fits perfectly with the rest of the game. I have no suggestions on the mechanics as I think they are solid, and I love the new stuff you're adding. I do have some comments on the animation though. Things seem to happen quite quick in some situations, making me feel a bit like "what just happened". Change Direction Block: Have the line pause for just a fraction of a second on the block to give the player's mind time to catch up. Restart Line Block: When you hit this block, have the tail retract all the way to the head before it continues moving again. This animation can be fast, but again is just to have the player catch up. Portal Block: Here just scale down the head quickly as it enters a portal, and scale it back up when it arrives at the new portal before starting to move again. Just wanted to chime in that the new icons feel quite jarring to me... It might be their obvious pixelation that's breaking the anti-aliased clean feel you had going before, or it could be that the thicker borders on special blocks are making them feel clunky now compared to before. I get that you needed to add icons to move away from only having colour as a differentiator, but maybe you could preserve the minimalist style by "popping off the plane" of your other sim? Maybe the wormhole is linked by a thread/portal behind the plane of the tiles? Maybe the jail block is still black but sticks up a little to indicate the trap and hold? I think there's room to go for a faux-orhtographic stylised projection sticking up and down from the tile plane that could give you more space to make the tiles different from each other without having to stack a ton of info into the small icon space. OR maybe just making the icons feel smoother will fix the sudden roughness? Who knows? @franvoisvn super congrats on coming 8th overall in Ludum Dare :D! Oh good grief this is good. The only thing I can add to the fantastic feedback offered above is to disagree with @EvanGreenwood on the visual style (and just on that, great comments otherwise). I do play a lot of mobile games, and visually this will absolutely fit in with the best of them. This is one of those games that make me go "why didn't I think of this". Good idea and good execution. I like how the black blocks jiggle when you try to go through them. I think this game can become popular on mobile. As for the icons - Have you tried making all the blocks like the final portal block? Like solid colour with transparent icon? I think that could contribute to maintaining the simplicity Dislekcia was talking about. @dislekcia: yeah, the GIF is definitely a bit sub-par, but even so, I agree that the icons are a bit busy and distracting (in the build I have too). I'll probably keep them pretty much as-is for the next build (although I'll probably try @Eric's idea first, thanks @Eric), so people can see what they really look like in-game, but then look at improving them soon if need be. Doing something more complex, like a faux 3D thing, might work well, but I think it probably makes sense to try determine the overall aesthetic direction a bit more first. Another idea we've been toying with is: selling some themed versions of Streamline, with a subset of levels/mechanics, as advertising games for clients. It should be pretty easy to customise it for a client: giving it an art overhaul, doing some level design and perhaps adding some mechanics. I figure we could make a reasonable profit on each deal, and I don't think it'll affect an "official" premium version too much, especially if our clients are typically targeting a South African market. This is something we've only just started thinking about, so it'll depend a lot on various factors like how much we can reasonably charge for a custom version, but I think it might be a nice way of getting some extra income. Just a quick note here that I'm loving the multiline to bits and pieces and enjoy how much they seem to be expanding the design space. It seems to have a good level of fertility right now. Thanks @Nandrew! I actually found the multi-line puzzles to be a bit less fun to play myself, so I wanted to get a few people's feedback first. I think I find them worse cause the UX isn't quite as elegant as with single-line puzzles. That said, it does open up the design space nicely, so I'll be keeping it around and try revisit the UX a bit later. My current version has separate level groups, so some can have the multi-line mechanic, while others might not. I am noticing that new mechanics I add have more design overlap with existing mechanics, and it's becoming more difficult to keep them as "orthogonal" as possible. I guess this is to be expected. It's still pretty easy to add new mechanics and try them, so for now I'll "dig" a bit more at the design space and see what comes up. At the moment, I'm looking at the design of Sokobond a lot for inspiration. It feels like there's a lot of overlap with Streamline I can learn from. In terms of visuals: I'm still a bit uncertain about how to proceed (although I haven't spent much active time working on it, so it's not like I'm toiling away). My intuition used to tell me that doing a few mockups and getting feedback based on those would work (perhaps iterating a few times), but now I'm not so sure. Would people really be able to give me the feedback I need just from mockups? Maybe I'm over-thinking this, and feedback on mockups is a good way to go forward, but I'm kinda unsure. After the LD results were announced, I got a lot more traffic than I expected. As of today, Streamline has had over 2600 views on itch.io, most of which are from post-results. Here's a graph of the last month, which start just after LD, with a little traffic from other judging - the big spike lines up with the results. These numbers seem fairly good to me, but I don't have very much to base this on. I guess being listed fairly high helps drive some traffic :) This has expedited my plans to add analytics into the game, so the next version should have some basic analytics so I can see: how many people are actually playing the game (currently views is my best measure), for how long they play, and what levels they're struggling with (and other analytics). I had a last-minute bug that I only just fixed so I'm a little too tired to write up much in the way of thoughts or such, but I figured I'd just do a quick announcement of the new version and maybe come back to update later when I have time and more sleep. I love this pure focus on level design so much. Don't have much feedback besides keep up the good work. Is a level editor possible ? Good good game. I can see myself getting this as a time killer. It's satisfying much in the same way that 2048 game was. Also the little things are cool. Like the line that now bends when you collide with it is a nice touch. I really like this game (I think more than all your other games so far). The following is obviously based on my taste in these types of games. I play a lot of them, so it's not quite advice fallen from the clear blue sky, but obviously it's just one perspective. I hope you find it useful. My main comment is that I think you can improve the level design; here are some criticisms and thoughts. There is a puzzle where you see for the first time how the force blocks behave when you are in the way; it was not as satisfying as it could be - I discovered this by accident, but unlike puzzle 6, it gave me a different feeling. I think accidental discovery should be limited to training levels, (in which case it is better to remove the other elements), and also delay finishing the level a bit from the discovery, so that it can sink in a bit. Then in follow-up levels it is part of the player's solution toolkit, and makes the more complicated puzzle more fun (because you are actively, not accidentally solving them). The final point is one of aesthetics. I think puzzles that have pattern, symmetry, balance are more enjoyable. It does not really affect how difficult they are or the pleasing insights you get, but it makes the puzzles feel more designed. (It also makes screenshots, and sets of screenshots more appealing: if you also have a visual hook for each level, they become more distinct, and the game looks richer than it would otherwise. Just visualize screenies of four levels with a pyramid, a spiral, rows, and a semi-checkerboard pattern compared to 4 random ones). I would also say this applies to the sequence of moves, so that the sequence of moves and interactions feels more symmetric / patterned (designed). For example, if the level requires a bunch of bounces and two reflections, put the reflections symmetric to each other in the sequence. (You can exploit these techniques in your randomization too: using symmetry is a trivial way to elevate randomly designed levels). And then, make the player aware of what is happening. I suggested a puzzle earlier where you construct a sequence of blockers using your own body; it occurs to me that you may have a puzzle like that in there. I don't remember. In a puzzle like that, you would not like distracting props. And to drive the point home, you would like some repetition, so that the player is very conscious of what is happening (and the level is more memorable). Similarly, a level with 50 portals is more interesting than one with a few random props for several reasons (it almost becomes a totally different game, it stands out, it just looks cool). This also makes the levels easier to talk about ("did you get to the hall of portals yet? "), which is always useful in the ocean where thousands of abstract puzzle games swim. * Remove clutter and make difficulty based on more difficult insights rather than distractions. * Put more focus on indirect techniques and see how far you can push it. * Make levels parsable to avoid some of the trial and error, and encourage more thinking. 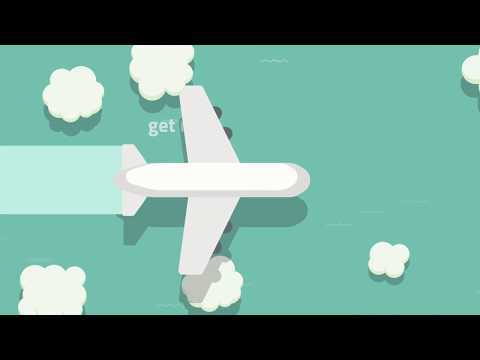 * Use visual hooks and deliberate spacing to make levels more appealing and memorable, and use repetition to make cool things cooler (or more obvious). @hermantulleken: Thanks so much for the awesome feedback. Sorry for the delay, been busy mulling it over and doing other work. discovering the "techniques" of the game is for me at the heart of the game. Ideally that's the aspect of the game I want to highlight with future design (so I personally agree with your comments), but I am also aware that this is not the case for everyone. The fact that I made the UX and level of juiciness fairly good from early meant that a bigger variety of players (than I expected) enjoy the game. I don't think improving the game in the way you suggest needs to be done at the expense of this, so that's great, but it should probably be kept in mind. 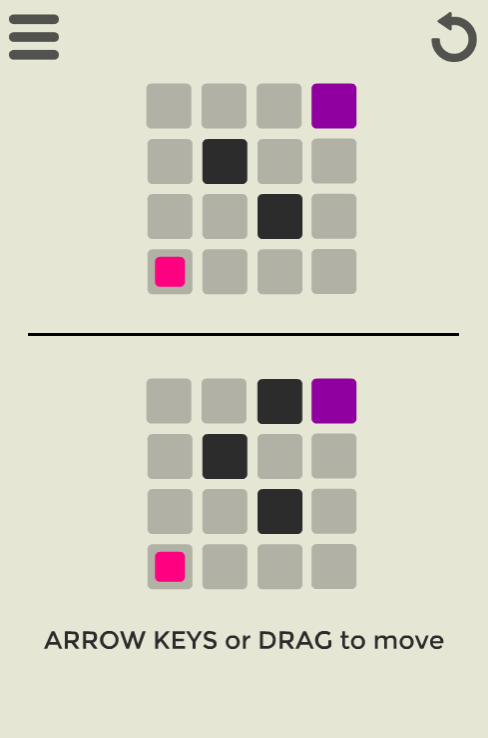 There is the "direct" techniques (moving forward until blocked, and then being able to turn", the core mechanic, for example), and then the indirect technique (like using your own body as a blocker, as the discover in puzzle 6 - which was set up as a nice surprize). The default behaviour of the force blocks is a "direct" technique, the way you can use it as a pause block when you block the direction is a indirect one. Escaping from your own body-loop is a nice indirect technique allowed by the pink blocks. I think your levels should be designed around these indirect techniques, because they give the player those "aha" feelings, and give you the bang-for-buck with a limited set of mechanics. I think "direct" techniques corresponds to inherent complexity (width) whereas "indirect" techniques corresponds to emergent complexity (depth). Without trying to oversimplify your feedback too much, it feels like what you're saying is: in terms of game design, the levels should be more elegant. In other words, the ratio of emergent complexity (depth) vs inherent complexity (width) should be higher. I completely agree that this is desirable and should be highlighted as much as possible. As the levels progress, you want to add a new mechanic (width++) and then drill down into it's implications (depth++), and then repeat, playing with the set of mechanics used. ...so that it can sink in a bit. Then in follow-up levels it is part of the player's solution toolkit, and makes the more complicated puzzle more fun (because you are actively, not accidentally solving them). This above ^ goes hand in hand with my next point: ideally, you would like your levels to be "readable". By looking at the level, the player should (at least roughly) be able to make out the basic "big steps" of solving the puzzle. Your game already does this to some extent: if you see a pink block, you know you gonna get trapped and use the block to escape. So you know you should move towards getting trapped (which is opposite from how you normally try to have a clear path between you and the goal). So the ideal level is set up as a bunch of choking points, so you play by going from one to the next in a more or less deliberate way. One other thing occurred to me afterwards. How do you actually design your levels? I had two experiences that opened up the mechanics of the games I was working on in very surprising ways; perhaps you can benefit from something similar. (As you may know) we made several clones of Lights Out on all types of grids. One version we worked on quite a bit, and we made nice levels procedurally. But the algorithm produced two puzzles that I could not solve. Our algorithm was theoretically only supposed to give solvable games, but I began to suspect a bug. So I set out to find a mathematical criterion to determine whether an arbitrary arrangement of cells switched on or off could be solved. This led to some interesting findings in itself, but also to the idea of marking all the cells that I clicked and a special "designer playing mode". And this simple idea just shattered the blindfolds and I could see right through onto the raw mathematical mechanics (it's a bit like the imagery in A beautiful mind) (jk :P). I discovered then the solution to the puzzles (~21 moves I think! ), that they were in fact the same puzzle (in that you could get from one to the other (of course all solvable patterns have this property, but in this case it was quicker to go from one to the other than to first solve and then go to the problem state of the other). Moreover, I got a clear understanding of how problems fitted into a hierarchy, and which ones were difficult and hard, and what were the core secondary techniques of the game. Just to be clear - this was not a "flash of insight", but rather deeper understanding while playing looooooots of example games in this mode - but still in a much shorter time than up to that point. The second instance was with a game a bit similar to yours in that it's essentially a path-finding game. (In our game, the decision was were to place the props; the movement was always constant except for how props change it). 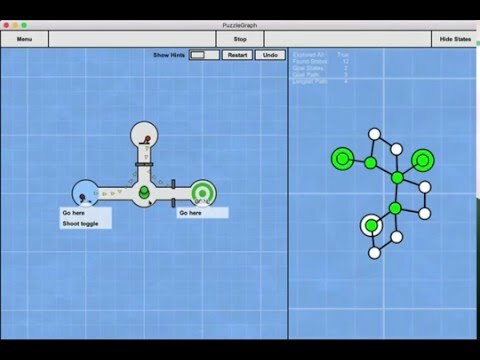 We built a level editor that would immediately show the path of the ship as you build the level. That made a dramatic difference in the design process... it just cut out an unnecessary part (before this, building a level is back and forth between solving and building). So you could see the consequences of each piece immediately. It's a bit hard to describe exactly, but again you could just see certain things that was not apparent before, and discover deeper things about the mechanics much easier. So these examples are quite specific, and maybe you are already doing something like this. But if you want some ideas for things to explore: try a level editor that shows you all possible paths as you build. Mark decision points, unreachable points, "inevatble points" (cells that all paths must pass through), and the rest (which is simply cells with single paths through them), in different colors, There are also other possibilities, such as marking regions that can be entered but not leaved (for example, for white cells sourounded by 7 orthogonal black cells (so one opening to get the line in, but none to get out), cells that can only be entered and left from certain directions, cells that lead to dead ends. ^ This is of course a bit of a different exploration (up-front it is not necessarily clear what will be useful and what not, and maybe none of it is), but my intuition is you will get quite a deep understanding of your mecahnics this way. Just played the HTML version. Love the new little animations and interaction sounds that have been added. I also frigging love the new mechanics you've added since the Ludum Dare build. You are getting so much mileage from the core mechanic. The larger puzzle boards (specifically "Basics") did seem a little intimidating at first, coming from the smaller more cosy ones. As a suggestion, how about having the first few large stages split into quadrants. Each quadrant can then be sort of a mini game that you have to solve, the goal being to line up with the exit to the next quadrant, and finally reach the exit in the last quadrant. This could introduce the player to the larger play area, while still providing the comfort of the "smaller" puzzles, easing the transition to the bigger possibility space. I'm actually not quite sure if grouping them by mechanic rather than size or difficulty is a good idea. The progression in the game is quite linear, so you would expect the difficulty to increase linearly as well. Having "New Mechanic -> Easy -> Hard -> New Mechanic" rather than "New Mechanic -> New Mechanic -> New Mechanic -> Easy -> Hard" might frustrate a player before they get to the new mechanics. Just so you know I finished all the puzzles :D I only mention this because mobile / casual is a very, very fickle client. I'm guessing you might meant "Scale" there, which has the largest levels by far (please correct me if I'm wrong). The way I'm going about trying to design levels to accomplish that is by improving the tools, like the level editor and infinite mode, so they can aid me in discovering the interesting interactions and designing some really elegant levels. This is a lot of fun, and I love the polish. It feels great when your line does the little "wiggle" as you hit it. Also, you get many bonus points for having an awesome favicon. Sorry, should have been clearer. I mean, make it match the current level you're on, and every time the player makes a move it updates it. I was mostly joking.